Anti-Tank WeaponsJust as every German tank was a Tiger for many Allied soldiers so every anti-tank gun was an 'Eighty Eight'.One of the great artillery weapons of all time the 8.8-cm anti-aircraft gun was certainly a tank killer of note.But it was not the only such weapon in the Wehrmacht's armory,not even the most numerous. 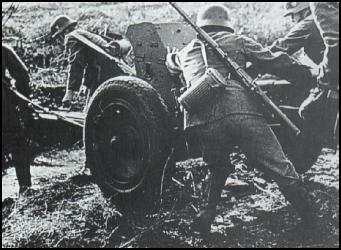 German troops used a wide verity of anti-tank weapons during the war,some captured from the enemy and others of futuristic design.In 1939 the standard anti-tank gun with which the German Army went to war was the 3.7 cm PaK 35/36.PaK was the standard abbreviation for PanzerabwehrKanone , or anti-tank gun.Small light and relatively easy to handle the PaK 35 was far from ideal for dealing with the larger and more powerful armored vehicles then coming into service.Indeed its crews ruefully called it the 'door knocker' because of its poor performance.Attempts to enhance penetration included the use of tungsten shot and a fin-stabilised muzzle-loaded hollow charge grenade , the Stielgranate 41.The PaK 35 had a maximum range with HE ammunition of 4,025 meters and could penetrate 36mm of armour, at 500 meters with conventional ammunition or 180mm at 300 meters with the Stielgranate 41.Over 20,000 guns were built during the war. Aware of the deficiencies of the PaK 35/36 the German Army Demanded a larger calibre weapon.Developed from 1938 the 5cm PaK 38 entered service late in 1940.The PaK 38 had a maximum range of 2,652 meters with HE ammunition.With tungsten shot it could pierce 55mm of armour at 1,000 metres.The appearance of heavily armored Soviet T-34 and KV-1 tanks gave a new urgency to anti-tank gun design and two new 7.5cm guns were developed , the PaK 40 being manufactured by Rheinmetall-Borsig and the PaK 41 produced by Krupp entered service.Both were fairly powerful , though the PaK 40 was effectively scaled up version of the PaK 38 , and the more advanced PaK 41 was a superiorweapon.The Krupp design was one of the first 'cone' or 'squeeze bore weapons to enter service.The internal bore of the barrel tapered slightly from breech to muzzle.The pressure behind the Pzgr Patr 41(HK)tungsten shot increased as it travelled down the barrel and it emerged with a muzzle velocity of 1,125 m/s.The shell consisted of a light ballistic cap behind which was a tungsten carbide shot.The shot was enclosed in an outer case with flanges at the center and base.The flanges were compressed as the shell passed along the barrel. The penetrative power of the advanced new weapon was remarkable ; the PaK 41 could punch through 145mm of armour at a range 1,000 metres.Fortunately for the Allies there was a shortage of tungsten in Germany.Another problem was barrel ware : the high pressures meant that the gun tube had to be replaced every 500 rounds.Eventuallyonlyy 150 PaK 41's were built. Above : The standard German anti-tank gun at the outbreak of war was the 3.7cm PaK35.Designed in the 1920s it was a light and handy weapon , though in 1940 its crews found that it could not deal with the thick armour of British and French infantry tanks. Family Of KillersIn 1944 Rheinmetall developed the 8cm PaW 600 , a muzzle loaded weapon which fired a fin-stabilised 2.7kg hollow-charge projectile.This was a very advanced concept for the time , but though it could penetrate 140mm of armour at 750 meters it could not engage an enemy much beyond that range.Given its impact on the battlefield the family of 88mm guns deserves pride of place in any study of German anti-tank weapons.Known as the Eighty Eight to its opponents and the Acht-Acht to its crews , the original 88mm Flak 18 was an anti-aircraft gun which had been designed in 1931 in Sweden.A team engineers from Krupp worked secretly with Bofors to get around the provisions of the Treaty of Versailles. The 'Eighty Eight' served as the basis for a whole series of tank guns and anti-tank as well as in its original role as an anti-aircraft weapon.However as the war progressed even those superb weapons were been faced with challenging new targets.Powerful Soviet tanks like the Josef Stalin (IS) 1 and 2 had larger hard hitting guns and much thicker armour then the T-34.A bigger gun was needed to counter them and in 1943 Krupp and Rheinmetall began work on a dual-purpose anti-tank/field gun of 128mm calibre. The PaK 44 saw only limited service before the war ended.Fifty one examples were produced mounted on an improvised carriage taken from an French 155mm gun.Firing Pzgr 43 shot the PaK 44 had a muzzle velocity of 1,000 m/s and could penetrate 230mm of armour at a range of 1,000 metres.Driven by desperate need by the end of the war German engineers were pushing the boundaries of artillery design.They developed automatic loaders for 75mm and guns and experimented with infrared sights to allow them to be used at night.Ammunition developments included the use of steel and plastic for shell cases to save brass.Through their campaigns in Europe and Russia the German Army had captured vast numbers of guns and vehicles and these were pressed into use as the war swung against them.Amung this booty were Soviet M 136 os M 1939 76.2mm field guns nick named 'Ratsch Boom' by the Germans for their distinctive sound when they fired. 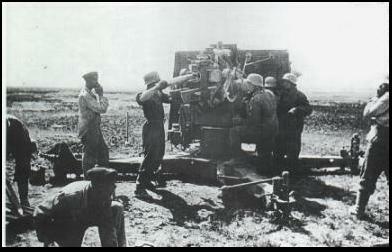 Above : The key to the success of the Eighty-Eight was the very high velocity of its shells.It could damage most Allied tanks even when firing high explosive rounds and with armour-piercing shot it was lethal.Curiously the German were the only nation which used heavy dual-purpoe weapons : most Allied armies had comparable anti-aircraft guns but these were never used to engage ground targets. Infantry WeaponsGerman infantry entered the war with two 7.92mm anti-tank rifles the PzB 38 and PzB 39 , however along with the 20mm PzB 41 they were not effective against the thicker armour of modern tanks.There was even a small shaped charge projectile which could be fired from the Walther 27mm flare pistol , though it was described as "very much a last ditch inaccurate and ineffective weapon".In 1942 however they received the Panzerfaust or 'armored fist'.This one shot hollow charge rocket propelled anti-tank weapon was designed by Dr Heinrich Langweiller at Hugo Schneider AG. Langweiller improved the design which initially had an effective range of only 30 metres.By the end of the war the Panzerfaust 100 could hit tanks at 100 metres.The shaped charge warhead of the Panzerfaust 30 could penetrate 140mm of armour.Later versions with 150mm diameter warheads could penetrate 200mm at a range of 80 metres.For many Soviet and Allied tank crews the greatest fear was the determined Panzerfaust-armed German infantryman lurking in the ruins or vegetation close to a track or road.The Germans recognized this type of cool courage with special tank destruction badges. However even if the weapon was effective and well designed it needed a gunner or crew with steady nerves to wait until a tank was within effective range before they opened fire.On 13 February 1943 a 20-year old Dutchman single-handedly knocked out 13 Soviet tank's with his French made PaK 97/38 during the attack in the Lake Ilmen area.Gerardus Mooyman a volunteer with the Waffen-SS Freiwilligen-Legion Niederlands became the first non-German to be awarded the Knight's Cross of the Iron Cross.By his own admission however Gerardus was a rather unenthusiastic soldier and was sulking in a bunker when the Soviet forces attacked.A German officer attached to the Dutch Legion practically dragged him out by his ear and the angry young Dutchman vented his fury on the advancing Soviet armour.